Have you seen this video? http://www.11alive.com/video/default.aspx?playerId=newsmaker&maven_playlistId=1f23dc40ee67898d157716d17d3efded65dbd23b&maven_referrer=mrss&maven_referralPlaylistId=1f23dc40ee67898d157716d17d3efded65dbd23b&maven_referralObject=1138688802 It is of a MARTA train operator texting on his cell phone while the train is running down the rail. The operator is texting on his cell phone while he is supposed to be driving a train carrying hundreds of Georgians just trying to get to their jobs safely. Unbelievable! Congratulations goes to Everyday Georgia Citizen Matthew Jones, who uses the MARTA subway train system to get to work and relies on the train operators to get him to work, and then back home, safely every day. Matthew spotted the train operator texting while the train was in operation on the tracks and took the smoking gun photo. Amazingly, the GM of MARTA says maybe the only thing that will happen to this train operator is a suspension. A slap on the hand! What will it take to insist on passenger safety? A train wreck while a MARTA operator is texting? Will that do the trick? We already know how deadly it can be for a train operator to be texting while he is operating a train, as evidenced by deadly train wrecks in Boston and in California (which I previously blogged about). Don’t we want to spare Georgia citizens that horror? We should all be vigilant like Matthew Jones. When we see a MARTA bus driver or MARTA train operator operating his bus or his train in unsafe manner, we must report that to MARTA. MARTA buses are identified by a bus number on the outside. The next time you see a MARTA bus operator run a red light, or other similar dangerous behavior, call MARTA with that bus number and report what you saw. The same should be done if you observe a MARTA train operator texting while driving, or asleep at the switch. 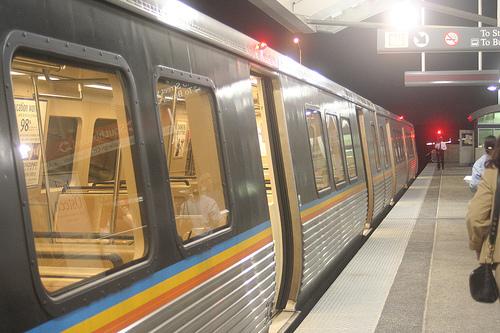 Maybe MARTA won’t do anything to the employee after just one complaint, but I would hope after more than one complaint the employee would get more than a mere slap on the hand. The more we do this, the safer our public transporatation will, hopefully, become. Be vigilant, Georgians!